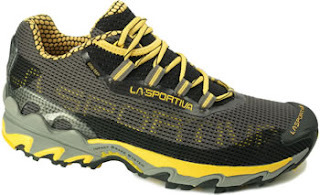 The new Wildcat running shoe from La Sportiva quickly became my favorite running shoe this winter. The shoe fits my foot perfectly and is the most cushioned shoe from La Sportiva. I thought there was a chance this would make the shoe unstable, but I could not have been more mistaken. The shoe is stable, has good traction, and breaths well. I have worn the shoe running on dirt, mud, snow, and ice. The shoe excelled in all but the ice arena and luckily I have a pair of Fireblades with the hobnails in them for that. The spring season will surely bring more mud and heat, and I believe this is where the breathable mesh will really excel. If you have cold feet, this may not be the winter running shoe for you. I wore the shoes in Alaska in February with heavy socks and they performed with aplomb. If you are looking for a well cushioned, comfortable, trail running shoe, look no further. I have about 25 days of running on them and I look forward to the next 25. Happy trails. I agree that the Wildcats have a boatload of cushioning. For trail running I've worn Rajas, Crossroads, and the Imogene. The Wildcat is the cushiest of them all. When I initially tried these on my concern was that it hugged my foot too snugly. I thought it would bind and cause blisters on long outings. I was wrong. After 150+ trail miles, the snug fit is just right because it keeps my toes from bashing into the front of the shoe. so this is the best shoes to practice this sport, excellent because I need some new sport shoes, mines in this moment looks like a strainer. When I was looking for help with los angeles alcohol rehab I didn’t know where to turn. I finally went with this center and they helped me save my life. Thanks for the post. I heard about shape shakes but, didn’t believe it until I tried it.